“Going up the Country” – Back to Binghamton. If you have been viewing this blog for a while, you know that a post about “Going up the Country” by Canned Heat has become synonymous with my trips up to Binghamton. What started as a quick and short post just to alert readers that I was driving four hours north to Binghamton (and could not post that day because of it), became a tradition, a sort-of good luck charm, declaring safe passage up to Binghamton University. I graduated from Binghamton last Spring and I am now settled into the world of commuting, but, as the title of this post suggests, I will be visiting the Ol’ Alma Mater this weekend, and therefore “Going up the Country” returns. 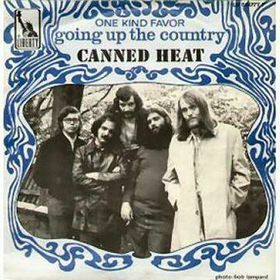 Canned Heat’s “Going up the Country” struck it big because of its appearance in the Woodstock movie. Because of its bluesy and rhythmic bustle, and apt message (for the journey to Woodstock was a trip up the New York country), the song became that Woodstock song. Alan Wilson’s trademark high-pitched and possessed croon just assisted in the song’s overall aura. I have posted about this song too many times. How can I possibly make this any different? Well, hmm, today I believe I will do my favorite cover version of the song. Here is “Going up the Country,” the 50’s shuffle version. The band is Kitty Daisy & Lewis and this country/rock-a-billy/all-around twang sibling throwback play music in London. This version of the song has gained over one million views on YouTube, which is a pretty extraordinary feat. It moves. It’s cool. A well-put together and filmed cover. But my favorite version (that is not the original) is not a cover at all. Instead, it is actually what the song is based on (or completely stolen from, matters who you ask). Alan Wilson is listed as the writer of the song, but Henry Thomas recorded the song with different lyrics in 1928. So, yeah, it’s stolen (not the lyric, but the entire melody) “Bull Doze Blues” is “Going up the Country.” Enjoy the quills!